Resources are things that man use and are prepared to pay for. They may be tangible - like water or wood - or they may be intangible - like skills. The resources that we deal with in this chapter are entirely within the first category. The things that we consider resources are closely linked to our cultures and our technological levels. The value that we give to a resource is determined by supply and demand. The rarer an item is, the more we will pay for it - provided that there are not alternatives available. If a resource can be replaced within a life-time, we consider it renewable. Trees are renewable because replanting can create replacement trees for those we consume. Wheat is renewable because new crops can be grown. Fish are renewable because new fish are spawned each year. Most renewable resources are, therefore, organic. Inorganic material is non-renewable. A finite quantity exists and once it is used up, there is no more to consume. Iron and gold are such materials. One is found in great quantity, while the other is rare, yet both are non-renewable in that new iron and gold cannot be created. We can only look for existing stocks that we have not yet found. possible to "harvest" renewable resources to the point where they face extinction. Cod stocks in Canada's Grand Banks were fished to the point where there was the very real danger that they would be rendered extinct. Over-consumption to this degree, naturally, renders a resource non-renewable. Renewable resources are continually available if the systems that produce them are not disrupted by natural change or by man's actions. Through desperation, greed or ignorance, man has caused irreversible changes to ecosystems, resulting in the loss of genetic diversity. 1. Define the term resource. 2. What is the difference between renewable and non-renewable resources? Provide two or three examples of each. 3. Under what circumstances can a renewable resource become non-renewable? Air is so plentiful that we have not generally thought of it as a resource. It exists all around us. While we use it, we do not pay for it. It would not, therefore, be considered a resource.However, oxygen can now be purchased on the streets of some polluted cities as people find the air that surrounds them to be increasingly toxic. The sum total of man's polluting of the atmosphere is an increasing problem - especially in places, like China, where coal-fired power generating plants pump tons of noxious fumes into densely populated regions. Furthermore, the recycling of carbon dioxide by plants - especially broadleaf forests - is being affected by global deforestation. Tropical broadleaf forests have sometimes been described as the "lungs of the planet" and these are threatened around the world - from Brazil to the Congo to Indonesia. Forested areas are harvested for their fibre and to create grazing and agricultural land.The new ecosystems that are created do not produce anywhere near the same amount of oxygen as the systems that they replaced. The burning of forests in large-scale clearances in Sumatra, Indonesia obscured the skies over Malaysia and Singapore for weeks at a time. We, in the developed world are concerned and unhappy about the loss of tropical rainforest. In the developing world our concern is seen as hypocrisy. Europeans long ago eliminated the great forest that covered most of Northern Europe. Indonesian teak is prized for furniture - in developed countries. We are the consumers - of the fibre and of many of the agricultural products. Those causing the problem are often driven by necessity. In the case of poor agricultural workers the long-term threat to global air quality is irrelevant when they have hungry mouths to feed right now. Similarly, loggers have the immediate problem of securing wages to provide for their families' needs. the 1980's, the so-called debt-for-nature (or debt-for-environment) swap provides the developing nation with payment for the preservation of threatened lands . Debt-for nature swaps have extended to more than 30 countries since 1987. It is sometimes suggested that direct payment by developed nations for the preservation of our planet's "lungs" is needed. 1. Why has air not been regarded as a resource in the past? Should it be considered a resource today? 2. Why is deforestation a threat to the air that we breathe? 3. Why does deforestation in developing countries continue, despite our knowledge of its harmful results? 4. How can we, in the developed world, help to reduce tropical deforestation? Like air, water was long considered limitless and, except in desert and semi-desert areas, given little value. Clean water supplies are, however, coming under considerable pressure. Given Canada's abundant supplies, we are largely unaware of the crises that face less well-endowed areas. In its 1998 Human Development Report the United Nations Development Programme noted that global water availability had dropped from 17,000 cubic meters per capita in 1950 to around 7,000 in 1997. It further notes that twenty countries suffered from water stress at that time, with less than 1,000 cubic meters per capita. 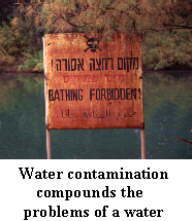 Water contamination compounds this problem. A diminishing resource necessarily increases in cost. Since water is essential for life, there is little choice but to absorb this cost. An unexpectedly abrupt decline in the supply of water for China's farmers poses a rising threat to world food security. China depends on irrigated land to produce 70 percent of the grain for its huge population of 1.2 billion people, but it is drawing more and more of that water to supply the needs of its fast-growing cities and industries. As rivers run dry and aquifers are depleted, the emerging water shortages could sharply raise the country's demand for grain imports, pushing the world's total import needs beyond exportable supplies. Lester Brown and Brian Halweil report in their article that this is not a matter of importance only to China and it is not something that the Chinese can easily address. A key political issue of the 21st century will be the management of water resources within nations. Between nations, control of watersheds are potential sources of conflict - particularly in water stressed regions. Political and religious divisions have resulted in centuries of strife in the Middle East. At a time when politicians seem to have the will to sort out their differences, the issue of water looms as a major irritation . 1. What trend has been noted in water availability in the last half-century?Suggest reasons for this. 2. What considerations must be made in managing water resources? Why is this a significant political issue within and between countries? In an increasingly urban society we are forgetting the significance of soil as a crucial resource. In ancient times Plato and Lucretius commented on the effects of soil degradation. Vernon Gill Carter and Tom Dale, as early as 1955, pointed out the huge impact that man has had on the landscape through poor agricultural practices. They clearly noted that soil degradation resulted in the collapse of entire civilizations. John Perlin, in his more recent work A Forest Journey speaks of the collapse of Central America's Mayan civilization as a direct result of topsoil degradation from deforestation. In Landline; Australia's National Rural Affairs Weekly, a reporter attributes Australian ecological problems to a "mismatch between Australian soils, water balance and climate and the traditional European farming and grazing methods." Desertification is certainly a problem in the world's driest inhabited continent. Farmers have long recognized the importance of various inputs to guarantee crop yields. Fertilizers supplement the natural nutrients of the soil. Pesticides eliminate organisms that feed upon these bountiful crops. Modern agribusiness depends on both of these. Yet such farming does not come without a cost. In her monumental 1962 work, Silent Spring, Rachel Carson kick-started the environmental movement by noting how the chemicals that we apply to plants and soil - particularly DDT - make their way up the food chain and are concentrated in the bodies of top-feeders. Since we are in that category, this was a sobering conclusion. Soil is a crucial resource around the world. 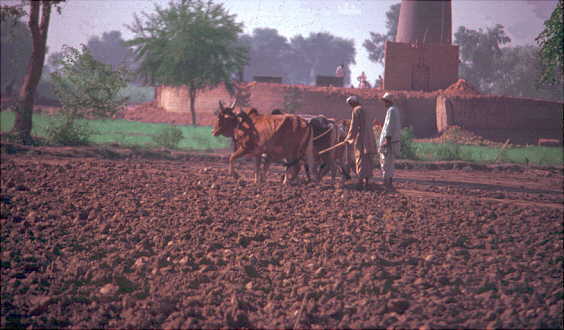 Like water, agricultural land is subject to competing demands for its use. Flat land is highly desirable for industrial, commercial and residential use. All of these bring greatly increased cash value for the land. Here in British Columbia, where only about 5% of our land base is suitable for agricultural use, we are well aware of the need to conserve this resource. During the 1970's an Argicultural Land Reserve was established. The idea was to protect our limited soil base from conversion to buildings and parking lots. Property owners naturally opposed restrictive laws that hold down the value of their property and prevent them from selling for prices well above the value of agricultural land. Piecemeal removal of parcels of land have taken place for numerous reasons. The net result is a decrease in BC farmland. Though residents of this province will not go hungry, since our wealth allows us to buy from elsewhere, this does increase demand for agricultural products from elsewhere in the world. If agricultural output is to keep pace with world population increases, we must focus not only on crops, but also on the preservation of the soil itself. 1. How have the actions of humans affected soil around the world? 2. What threats are there to the planet's agricultural land? 3. What efforts have been made in British Columbia to preserve farmland? Why has this been controversial? Man's most fundamental need is nutrition. On a global scale it is very fortunate indeed that huge increases in food production have taken place. Despite phenomenal population growth, more people now are better fed than at any other time in history. Man has come a long way from the hunting and gathering species that emerged out of Africa to dominate the whole of the planet. The domestication of plants, which most people believe began in the great river civilizations of the Nile, Yellow, Indus, and Tigris-Euphrates River Valleys but a few thousand years ago, has profoundly changed our planet. 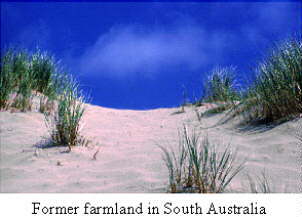 Agriculture simplified many ecosystems. One or a few crops replaced the natural biological diversity of vast tracts of land. The result was food surpluses that made civilization possible. Man's ingenuityhas shaped landscapes, has bred new variations of plants and artificially assisted domesticated plant growth to produce enormous yields. Since the 1950's the application of new scientific techniques has accelerated this process dramatically. Work by Dr. Norman Borlaug and others led to the so-called Green Revolution. On a positive note, the Green Revolution resulted in tremendous yields of staple crops. In Mexico, the average wheat yield per acre was around 700 kg per hectare between 1925 and 1930. The introduction of new, high yield, varieties resulted in yields of 2400 kg per hectare between 1965 and 1969. These yield increases are hugely important since they resulted in food production outstripping population growth. Green revolution technologies have been applied primarily to wheat, rice and potato production. In the case of the first two of these, new fast-growing dwarf varieties expend most of their energy producing the consumable part of the plant, with minimal stem growth. Fully 70% of wheat growing areas outside China are now planted with these new varieties. In all, world grain production rose From 273 to 343 kg per capita between 1955 and 1985.Since then, the rate o production has slowed as more marginal lands have been brought under cultivation, with less significant gains made on this land. The Green Revolution has critics. The price of miraculous improvements in yields is paid out in additional inputs to the land. Fertilization is needed, and this is often oil-based.It takes 1.2 barrels of oil to produce a ton of grain in developed countries. Eight percent of the world's oil production is now committed to industrial agriculture. The Green Revolution requires technology and this favours rich and corporate farmers.The poor, who need yield increases most, cannot afford to participate. New varieties also replace native crops and many observers fear the reduction in genetic diversity. irrigation to avoid wasting water. Apomicticplants may be bred, allowing them to reproduce asexually. Farmers could then produce their own seed. Another goal could be to replace annuals, like corn, wheat and rice, with perennials. If genes from nitrogen fixing plants, like legumes, could be introduced to other plants, then the expense of adding nitrogen as a fertilizer could be avoided. Supporters of this work describe it as the start of a Second Green Revolution, while detractors oppose the introduction of "frankenfoods" into our cropland and onto our dinner tables. The up-side of genetic engineering is that plants may be made to grow larger, quicker, or in conditions that would normally be considered impossible. They might also be developed with immunity to diseases. This is done by introducing specific genes from other plants, bacteria, viruses or animals to alter the basic genetic blueprint of a given plant. Critics fear unforeseen consequences of this work. What happens when unrelated genetic material is introduced? Does it only affect the particular trait that the scientists are aiming for or do changes occur elsewhere too? Such technology is also patented by major corporations, like the huge food business Monsanto . Will this remove control over crops from farmers and place it in the hand of trans-national corporations? Will these companies use their products to dislodge traditional farmers? 1. What impact has the development of agriculture had on natural ecosystems? 2. What is the Green Revolution and what have been its positive and negative outcomes? 3. What is gene splicing and what effect is it having on modern agriculture? What positive outcomes are possible? 4. Why are many people, inside and outside the scientific community, critical of gene-splicing in agriculture? Domestication of animal species happened millennia ago in land-based agriculture. This was not common in the water realm until recently. Oceans, lakes and streams have long been fished by man, but in recent years more intensive fishing and improved technologies for finding and harvesting fish has resulted in serious depletion of some species stocks. North America's Grand Banks was once one of the world's most important fishing areas. Stocks seemed unlimited. This is no longer the case. Canada's Atlantic cod fishery was shut down in recent years in an attempt to allow fish stocks to rebuild after cod were fished to near extinction. This alarming trend appears to be happening off the West Coast to salmon stocks as well. This is a global problem. In the 1998 Human Development Report, the United Nations claimed that about 25% of the world's fished stocks are depleted and another 44% have been fished to their biological limit. We are faced with the choice between limiting catches or increasing fish supplies through human intervention. For more than 2000 years, cut grasses have fed carp while animal manure treated to kill parasites and bacteria has fertilized the ponds where the fish are raised. The ancient practice is known as integrated fish farming, a type of micro-ecosystem linking water, fish, manure, animals and crops. "as more people are turning to fish for a health-conscious food staple, aquaculture could stave off the threat of fished-out oceans in the next 40 years... Aquaculture - or fish-farming - will play an increasingly important role in both conserving existing wild stocks and producing more fish food..."
Aquaculture - the aquatic equivalent of agriculture, involves cultivating water species in controlled environments. These could be in ponds, lakes or pens within the ocean. Fish farming is an increasingly important element in food production around the globe, be it producing carp in the ponds of China, shrimp in Thailand's coastal waters, Atlantic Salmon in Norwegian fiords, or Pacific salmon in BC's Georgia Strait waters. Aquaculture is a new business in much of the world, however, and it is not without its problems. Water quality must be maintained or farmed stock become sick in their pens or ponds. Widespread use of antibiotics to keep farmed fish stock healthy may pose long-term problems from humans that consume this product. Some worry that human tolerance of antibiotics may increase, or that anti-biotic resistant bacteria will evolve, posing health threats to fish and people alike. The escape of farmed fish and their mingling with wild stocks in British Columbia's streams alarms many scientists who worry that domesticated stocks will displace and bring extinction to wild local species. Aquaculture also involves the introduction of monocultures into areas of great biological diversity. This has, of course, been the case in land-based agriculture from ancient times. The elimination of mangrove swamp in South-East Asia has been one outcome of the huge increase in shrimp production in that area. It is estimated that only about 50% of original mangrove areas in subtropical areas remain. Developing agricultural techniques was a hit and miss proposition since man first domesticated plants several millennia ago. Man has had tremendous success, but also significant failures.Are we prepared to embark along the same path in the earth's waters or are the dangers of taking this path too great? Innovation has its risks. Each new development must be evaluated. 1. What is happening to wild fish stocks around the world? 2. What is fish farming or aquaculture? 3. Though aquaculture has been practiced for millennia in China, it is quite new in British Columbia. What problems have been associated with it here? 4. What problems are associated with shrimp farming in South-East Asia? 5. Do you believe that fish farming has a future? Why or why not? Just as our appetite for food crops grows, so too does demand for industrial crops (non-food) like timber and cotton. The same concerns over the replacement of natural diversity with monocultures that we encountered earlier in our discussions of agriculture and aquaculture exists here as well. Doing without these products is not really an option, however. We need to balance our needs. Land use issues must be debated and reasonable decisions adopted. Agriculture and silviculture must adapt to ensure production and continued genetic diversity. Perhaps the most vivid lesson from industrial agriculture going badly wrong comes from the areas of Kazakhstan and Uzbekistan. During the 1960's the Soviet Union embarked on an ambitious campaign to expand wheat and cotton production in what was described by Nikita Khrushchev , the Soviet leader, as the Virgin Lands Campaign. The decision to irrigate huge tracts of land meant the diversion of much of the water flow from the Syr-Darja and Amu-Darja rivers. This proved disastrous for the Aral Sea the world's fourth largest inland sea. With only a dribble of water now reaching it, the sea is drying up and salinity is rising dramatically. It will be gone entirely in 15 years if nothing is done to rectify the situation. Ports now lie 80 kilometers away from the lakeshore. Fish stocks have died in the salty sea-waters. Respiratory illnesses have increased dramatically as the dry salty seabed fills the skies on windy days. This is combined with the effects of drinking pesticide-laden water. Public health is deteriorating and children are increasingly born with defects. To fix the problem would require an end to irrigation, at least for a time. However, to do this would destroy the livelihood of wheat and cotton farmers. This kind of decision lies at the heart of local, regional, national and international politics. as local absorption of precipitation is significantly reduced, and animals, birds and insects find their local environments significantly altered. These concerns were given strong consideration when British Columbia adopted a new forestry practices code in 1996. Large tracts of land were also reserved as parks in the 1990's. However, these changes did not end criticism. Organizations like the Coastal Rainforest Coalition , the Sierra Club , and Greenpeace all are still highly critical of British Columbia's forest industry. Most attention is focussed on the logging of the few old-growth forests that remain in the province. The so-called "war of the woods" seems to erupt every year in the spring and summer months. Employees of Canfor , Weyerhauser , and Weldwood to name just three of the major BC operators, find themselves confronting determined and well-organized environmental protesters. Elsewhere similar struggles are also occurring. Exactly the same kind of struggle is taking place in Washington State's Olympic Peninsula . Land use conflicts in tropical rainforests, like those of Brazil and Borneo are even more controversial. Though plant life in tropical rainforests appears lush and robust, outward appearances can be deceiving. Trees anchor these ecosystems and their removal pose significant challenges to the survival of other life as well. Tropical soils are generally low in nutrients; this contrasts with the soils of temperate areas. Much life in these systems is centered on the trees themselves, with the forest canopy itself providing the necessities of life for many plant and animal species. Without tree cover, soil is washed away by heavy rain. Traditional slash and burn agriculture as practiced by forest dwellers involves the burning of small patches of forest. The ash provides nutrients for the soil, but this is quickly depleted and new primitive farmers have to move on. In these small patches, the jungle rejuvenates itself. 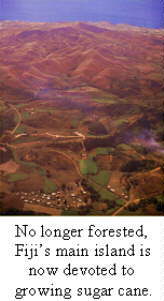 Modern clearing, for wood, for grazing or for mining, tends to strip larger areas and the sheer scale of deforestation makes rejuvenation more difficult. In addition, tropical deforestation has been linked to climate change and species extinction. We expect long-term shifts in average climate conditions and/or a change in the frequency of extreme climate events as a result of climate change. Both will have significant direct and indirect impacts on our lands, our oceans and our resources. In some areas of the country, current changes in climate are impacting upon natural resources, water resources and the associated socio-economic systems. We do live in a global village and actions taken in other parts of the globe can significantly impact upon us. This is especially true with phenomena like global warming, which can be attributed to a combination of actions taken around the world. The burning of tropical forests is but one contributor to global warming. Are those who burn or harvest tropical forests to blame for their actions and are they aware of the consequences of their actions? In some cases this is so; in others it is not. Small-scale subsistence farming is a matter of survival. Harvesting of forests for the consumption of the developed world is another matter. So too is the raising of hamburger meat in Central America's former rainforest. 1. What was the Virgin Lands Campaign?Why did it create an environmental disaster? 2. Why is saving the Aral Sea a difficult problem to resolve? 3. What silviculture issues are facing us in British Columbia? How might they be resolved and what are the economic consequences of your solution? 4. What is the greenhouse effect? How is tropical deforestation a contributing factor? 5. How will the greenhouse effect affect us in North Vancouver? Explain. location, Canada is blessed with enormous mineral resources. Chad - a small land-locked African nation - is less fortunate. South Africa, though nowhere nearly as large as Canada, is, in the year 2000, home to 80% of the world's manganese ore reserves, according to the US Geological Survey , and 73% of the world's chromium. Is it any surprise that the political future of South Africa interests the world far more than that of Chad? Guaranteed supplies of these and other mineral resources are vital for the continued health of global and local economies. Securing resource supplies has motivated foreign policies of Great Powers of the world throughout history - whether it was T'ang China's control of the Eurasian Steppes to ensure its supply of cavalry horses, to America's intervention in Middle East politics to ensure a continued flow of oil since World War II. In its first years of existence OPEC was unable to do much more than stop the downward pressure on oil prices resulting from more production coming on stream. However, by 1970, the organization controlled 41% of world production. The stage was set for what came to be known as the First Oil Shock. This was a direct result of Arab oil producers deciding to use oil shipment as a political and economic weapon in their ongoing conflict with the state of Israel. The 1973 Yom Kippur War saw the usual alignment of forces. Arab countries, even those not involved in the fighting, stood together against Israel, with equipment supplied by the Soviet Union. The United States supported Israel with supplies and military equipment. This situation was "normal". What was unusual this time was the announcement of an oil embargo on nations supporting Israel. To back this up, they began to cut oil production. "Friendly" nations would not be affected by the embargo. The United States, Holland, Portugal, Rhodesia and South Africa all saw Arab oil shipments stop. Naturally a domino effect occurred as embargoed countries turned elsewhere, putting additional pressure on non-Arab supplies. Oil prices skyrocketed, with the well-head price of a barrel of oil moving from $2.90 to $11.65. Prices at the pump followed suit. American oil companies redirected tankers at sea to American ports, causing shortages at their original destinations. Oil shortages in the United States became critical, forcing prices steeply upward. Shortages led to government legislated closures of gas stations - generally on Sundays, to slow demand. Stations ran out of supplies and long line-ups were common as American motorists desperately tried to keep their vehicles mobile. 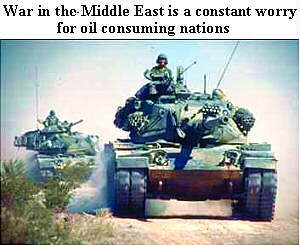 In 1974 the United States tried to organize a consumer's cartel to counter the Arab oil producer's influential position. This gesture failed because oil-consuming nations preferred to make bilateral arrangements to ensure supplies. High prices remained in place during the mid - 1970's and the impact that this had on the world economy was enormous. The US economy was severely strained by the dual impact of paying for the Vietnam war , which ended in 1975, and absorbing the new high oil cost. The result was stagflation, a stagnant, or even declining, economy at the same time as inflation drove prices upward. US gross national product declined 6% in the two years following the crisis. Japan's economy also declined, ending the Japanese economic miracle that had seen constant growth since post-war rebuilding began in 1946. Attention now turned to fuel alternatives. Nuclear power found increasing acceptance for large scale power generation. On a smaller scale, research into solar and wind power generation increased dramatically. Even more significantly, oil consumers looked to non-Arab, non-OPEC supplies of oil. North Sea oil production ramped up considerably. Higher prices made frontier oil in much of the world an economical alternative - whether it be offshore production in the North Sea or separating oil from sand in the Athabasca tarsands of Alberta. In addition, attention was given to minimizing consumption. European companies installed switches to stop escalators when they were not in use and apartment buildings employed time-delayed switches to turn off hall lights when there was no-one present. North Americans, for the first time, turned away from their traditional gas-guzzling VǊ engines and began to buy compact and sub-compact cars. To avoid another political and economic catastrophe like the shock of 1973, the United States decided to stockpile oil, beginning in 1977 in a strategic petroleum reserve . In 1979 a second oil shock underlined the importance of this move. Chaos in Iran accompanied revolution . (Oil production in a key world supplier stopped. The anti-American stand of the new Iranian Islamic Republic led to an American embargo on Iranian oil exports and the freezing of Iranian assets in the United States. When war broke out between Iraq and Iran in 1980, all oil shipments proceeding through the Persian Gulf was at risk. Production levels in both combatant nations dropped. drove many of these countries into depression and even financial crises, with countries like Mexico on the verge of monetary collapse. OPEC countries saw slackening demand for their product. Iran and Iraq were desperate for foreign currency to pay for weaponry of all kinds and they were willing to undercut OPEC prices to secure these funds. Countries like Saudi Arabia had little choice but to raise production dramatically to retain market share. Over the long term this drove prices down. Prices at the pump in the developed world did not reflect the reduced well-head price, but this was because of national and regional tax policies. This also gave developedcountries a little more flexibility to deal with possible future oil crises. When yet another Middle East Crisis took place in 1990, as Iraq invaded Kuwait , the world expected another shock comparable to those of 1973 and 1979. That it did not do so with Iraqi and Kuwaiti stocks removed from world supplies is due almost entirely to a policy decision of the world's most important producer, Saudi Arabia . This was the one producer with enough surplus capacity to pick up the slack. Iraq attempted to destroy Kuwaiti production prior to their retreat and defeat. In addition, a continuing embargo on Iraqi oil while that nation defied international requirements for the elimination ofparticular weapons meant that Iraqi and Kuwaiti stocks remained unavailable at the same time. The impact remained negligible because of Saudi production. Well-head prices remained low throughout the 1990's. Though prices at the pump rose significantly in 1990, much of the impact was due not to modest well-head price increases, but high levels of taxation. Nations have the ability to adjust pump prices if they need to. We can also turn to more fuel-efficient vehicles, as Europeans have done for some time. What we cannot control is that oil supplies are diminishing constantly; this is, after all, a non-renewable resource. 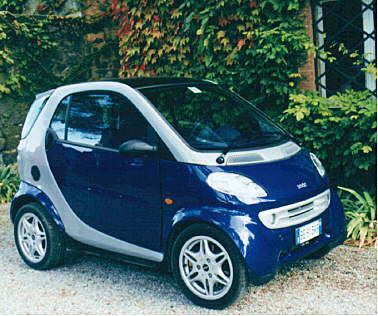 Swatch car - the future in commuting comfort? 1. Why is the world more concerned with events in South Africa than Chad or Nepal? 2. What is OPEC? How did it trigger the First Oil Shock? 3. What impact did the Arab oil embargo of 1973 have on the developed world? 4. How did the oil crises of the 1970's influence research in alternative sources? 5. What sparked the Second Oil Shock?Why did it have a greater impact on developing than developed countries? 6. Why was there not a Third Oil Shock during the 1990 Gulf War? The 20th century was a century fueled by oil. What will fuel the world's economies in the 21st century? Mankind constantly moves from one technology to the next. His curiosity is insatiable and the result has been constant change throughout history. One finds this true in all areas. In shipping we have moved from muscle power to wind, then coal, then oil, then, for some, nuclear. Each new technology provides some measure of improvement over its predecessor, whether it is cost, speed or ease of use. It would be foolish to assume that this change would simply stop. As oil increases in price or cannot meet needs, we will switch to something else - perhaps something that we cannot even conceive of today. As particular resources are depleted, their relative costs rise against potential alternatives. Consumption patterns shift. If alternatives are not readily available and needs become more apparent, research increases in the necessary areas since rewards for success increase as the need strengthens. The internal combustion engine has been essential in powering transportation during the 20th century. Its appeal is diminishing as fuel prices at the pump rise and the net result of its noxious gasses accumulate in our cities. Huge progress has been made in increasing the efficiency of such engines and reducing their pollution, but we cannot escape the fact that internal combustion engines rely on non-renewable fuel. Considerable research is being directed at finding alternatives. Places like California have enacted strong legislation to reduce allowable emissions. This is driving research by all of the major automobile manufacturers who fear losing this major, profitable, market. Here in North Vancouver, Ballard Power Systems is working on a new energy source to power the vehicles of the future. The waste product from Ballard's fuel cell technology is water. Oxygen and hydrogen are the necessary fuels to drive the system and there is absolutely no noxious by product as a result. Though this is a technology in its infancy, it shows such promise that major vehicle producers around the globe are investing in Ballard. The oil crisis of the 70's spurred tremendous research in solar and wind-generated power. The investment of public and private funds brought significant results. The history of solar power is a long one, but efficient harnessing of the sun's rays is only a recent development. The efficiency of photovoltaic cells, which harness this energy has improved by as much as 17 or more times from the 1% efficiency level common when these devices were first invented in 1839. Though the cost of installing systems appears high in comparison with other power sources, it is offset by very low operating costs because maintenance is minimal. In areas with consistent sunshine solar power is an increasingly attractive alternative. There are no harmful emissions and the resource is essentially unlimited. As use increases, larger numbers of photovoltaic (pv) cells are produced and the unit costs decrease. Wind power is another source of energy that has been employed for thousands of years, but has been overshadowed by newer technologies. 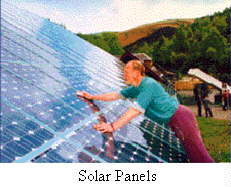 Like solar power, it received much more attention as a result of the oil crises. As with solar power generation, most applications are smallish in scale, generating enough power for local use only - perhaps to power a water pump or most of a single home's needs. Wind farms, like Kilronan , in Ireland, consist of a group of wind turbines which generate power that is added to the regional power grid. 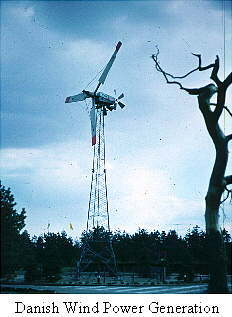 Consistently strong winds are needed for this method of power generation to be economical. Where this is possible, the result is clean power at quite low cost. TelosNet's Illustrated History of Windpower Development reports that "In California, over 17,000 machines, ranging in output from 20 to 350 kilowatts, were installed in wind farms between 1981 and 1990." It further notes that, together, these units generated "over 3 million megawatt hours of electricity, enough (at peak output) to power a city of 300,000. In the first few decades after World War II there was much considerable enthusiasm for nuclear power as the solution to our growing energy needs. 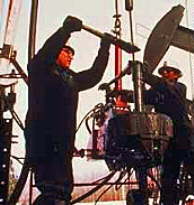 The Oil Shocks of the 1970's gave further impetus to development of this industry. Nuclear power plants are now found around the world, from Ontario to Bulgaria, to South Korea, electrical power is generated by this means. For some countries, the military possibilities of using enriched uranium, a by-product of some reactors, for nuclear weapons is also appealing. However, there are significant problems associated with nuclear power generation, not the least of which is disposing of radioactive materials. These include not only spent fuel rods, but also all of the material exposed to them, From cement to machinery. These materials must be securely stored for thou ands of years. When nuclear power plants finally reach the end of their useful lives, the problem of dealing with decommissioned reactors becomes a complex and pressing issue. Nuclear accidents, small, like the leaks at Ontario's Pickering facility and large, like those at Three Mile Island in the United States, and at Chernobyl in the Ukraine, have further tipped the balance of popular opinion against nuclear power generation. Some nations, like Sweden, have banned its use altogether. like helium. The problem faced by scientists includes sparking the process in the first place, then containing it if it is to continue long enough to produce energy. The promise is huge, with success meaning limitless power produced without creating air pollution or the need to store vast amounts of radioactive material, since the radioactive decay of materials that might be used in fusion reactors is much quicker than for those used in the fission process. Storage will still be an issue, but less so than today. In March, 1989 the media generated considerable enthusiasm when it reported on a press conference held by professors Pons and Fleischmann at the University of Utah. The two researchers took this unusual step of going to the press directly instead of following the normal process of publishing in scientific journals for two reasons. First, they feared that they would be scooped by another scientist, Steven Jones of Brigham Young University, who was working along similar lines. Second, they felt that they had made the most important discovery of the millennia - that Cold Fusion was possible and that it would solve the world's energy problems forever. In April, 1989, another researcher, Francesco Scaramuzzi, in Italy this time, pronounced that he had discovered yet another process to create cold fusion. Though developments were still in their infancy, the future looked very bright indeed - and grant money for fusion power research grew enormously. Some respectable labs claimed that they had replicated Pons and Fleischmann's work, so the enthusiasm continued to build. Then, disturbing reports began to surface that other researchers were unable to replicate the successful work of Pons and Fleischmann or Scaramuzzi. Others insisted that cold fusion was theoretically impossible. The United States Department of Energy asked its Energy Research Advisory Board to investigate and provide recommendations to the DOE as to whether or not it should support further research. ERAB reported that it should not do so. Were Pons, Fleischmann and Scaramuzzi, as some scientists suggested, charlatans in search of a modern "philosopher's stone" or were their results tainted by poor experimental controls? Governments and their agencies have pulled back from their initial enthusiasm and have cut funding to cold fusion research. Those scientists who continue to work in the area find themselves outcasts from the scientific community. Interest in cold fusion has certainly cooled since the heady days of 1989. Science provides dead end roads as well as brightly lit paths to the future. and an essential tool of business. The continual extension of copper telephone lines has been an ongoing process. 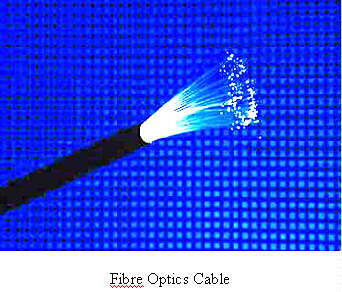 The replacement of main lines with fibre optics has still required huge investment in land-lines. Creating this infrastructure has been hugely expensive, as has maintaining this complex system. Tidal power generation is possible in some locations where huge amounts of water are funneled into bays or estuaries. Turbines are turned as water flows in or out of confined water bodies. Generation of this power is clean, but requires the building of dam-like structures, which would effect local ecosystems. Such systems are possible in few places, but where they have been built, they have contributed positively to local power grids, like at La Rance , in France. Geothermal power generation is also possible in some locations. Like tidal power, its applications are quite localized and tend to be fairly small scale. However, geothermal power's contribution to power grids is equally helpful. In Iceland, where geothermal activity is abundant, it is used widely. Similarly, geothermal power is an important contributor to power generation on New Zealand's North Island. Rotorua's hot tubs are heated directly by hot water flowing from beneath the earth's surface, while near Taupo, electrical generation. At plants like Wairakei workers brave the significant noise and noxious fumes to create produce inexpensive electrical supplies. Here in British Columbia, BC Hydro has looked at the possibility of generating power at a site near Mount Meager, outside Squamish. Very small scale energy production in the form of biomass energy is used around the world. In Developing Countries farmers mix animal dung with water in special tanks in order to produce a gas which fuels their cooking stoves, while the residue sludge is used as fertilizer. Quebec City burns garbage and sells the steam to power a pulp & paper mill. Closer to home, the Burnaby Incinerator not only reduces the mass of domestic wastes from a number of greater Vancouver municipalities, it also sells steam power that it generates to a local recycling plant, while also recovering metals and producing material for road-construction. Scrubbers remove almost all of the emissions from the gasses produced in the burn and almost no particulate matter leaves the smokestack. Perhaps the best way of generating additional electrical supplies is to conserve what we already have. A considerable amount of power is lost through needless waste - from leaving lights on in rooms without people in them, to having machinery, like escalators, run continuously, even when not in use. The computers on which this chapter was written are Energy Star compliant. Monitors shut down when computers note inactivity for more than ten minutes. Since the 1990's cell phone technology has developed rapidly. Many individuals in the developed world are trading in their old fixed systems with new miniature Nokia , Sony or other mobile handsets. As this technology and its supporting networks improve, there is the very real possibility that consumers in the developing world can leapfrog over the land-line systems that we have grown up with. Mumbai (Bombay) businessmen are experiencing the future today. Computer technology also offers some hope for improving our resource situation. The ability to monitor resource use and control inventories efficiently help companies to operate on a leaner basis, with less waste. Businesses are now discovering how the internet allows them to deal with suppliers and consumers more efficiently. 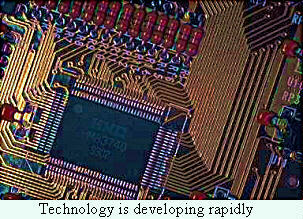 Furthermore, these technologies allow the sharing of information to help research in all areas. An early hope for computer technology was that electronic information storage would reduce our need for paper. The paperless office was a frequent topic of discussion. This did not come about, however, though some people still believe it actually will . Paper use actually increased. We must remember that technological developments do not always turn out as we think they will. Finding solutions to resource issues, particularly in the case of non-renewable resources, is a time-sensitive issue. It is also an on-going process without any final resolution. The same Internet technology that allows scientists from around the world to collaborate on solving a technical problem can be used by conservationists to generate public support on pressing issues or by company executives to ensure that materials arrive for processing on a just-in-time basis. 1. Why is there a trend toward developing alternative energy sources to oil? 2. How is California's emissions standards legislation affecting automobile development? Would the automobile industry pay as much attention to British Columbia passing similar pollution restrictions? Why or why not? 3. What technology is Ballard Power Systems, in North Vancouver, developing? 4. What other energy generating technologies are being developed? What are the advantages and disadvantages of each? 5. Why was there tremendous enthusiasm for cold fusion in 1989? Why has this enthusiasm died? 6. Why didn't the paperless office come about? 7. Why do new technological developments offer hope for conservation? Since the world is primarily a closed system, it makes sense that our use of its resources has merely changed the forms of the materials we have used. Recovering material from waste is important today, but it will become increasingly important in the future as non-renewable resources deplete. In addition, recycling is essential if we are to avoid burying ourselves in our own garbage . It is estimated that up to 80% of American garbage finds its way into landfill sites. Given the amount of rubbish we create, this is an incredible waste of land. All of the material that we dump is composed of chemical, mineral and organic material, much of which could be put to use. Given the decomposition time of many materials, particularly metals and plastic, storing wastes in landfill is a poor solution. Nylon takes 30ᆼ years to deteriorate and plastic dishes 50ᇤ years. Metals have long been recycled; the challenge for the future is to do the same with synthetic material. In Germany scientists are working on finding a way of breaking down a material called duroplast - a plastic reinforced with natural fibres, like wool. 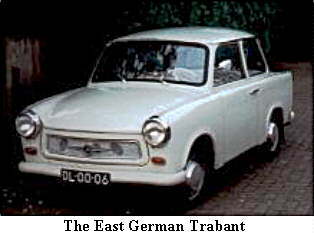 This was the material that composed the bodies of East Germany's Trabant automobile. Produced for decades, this car was a small, underpowered, gas-guzzling vehicle that soon fell out of favour when East Germany merged with capitalist West Germany. A popular joke at the time asked "How do you double the value of a Trabi?" The answer was "fill its gas tank." Germany faces a massive problem in disposing of dead Trabis, yet they are confident that a solution will be found. 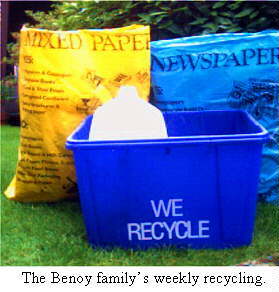 What has hindered recycling in the past has been the cost of recycled materials in relation to the cost of new product. This issue resolves itself as the cost of raw materials rise or as governments take the lead, insisting that producers of goods add waste disposal cost to the price of their product.By reducing or eliminating such levies on recycled goods, this makes recycling more attractive. Placing deposits on recyclable goods also encourages recycling. A few years ago, North Vancouver consumers paid deposits on glass pop bottles and aluminum drink tins only. All other glass containers and alternatives escaped the levy, with the natural consequence that alternatives were less expensive. This increased waste and discouraged recycling. Now, with deposits required on tetra-packs, many plastic containers, all liquor bottles and all of the containers already having deposits levied, there is great incentive for consumers to keep these items out of landfills. When this was introduced in BC, it involved the cost of setting up glass crushing equipment at all liquor stores so as to deal with the volume of glass returns, but because these stores were an arm of the provincial government, it made economic sense to set up this equipment. The same government that was selling liquor was also responsible for some of the economic costs of pollution. In the private sector, Save-On-Foods in North Vancouver introduced a "Changes" recycling depot at its Brooksbank location along with 6 others in the province. The company looks to a future where recycling is an integral part of shopping. In some places, reverse vending machines have been introduced. Here, consumers return used cans and bottles and have their deposits reimbursed. The introduction of a blue box, blue bag, and yellow bag recycling system, has also made home recycling easier than in the past, when consumers had to package recycled materials and take them to depots themselves. The North Shore Recycling Programme estimates that only "2% of the material collected in the program are contaminated and are thus garbage and must be landfilled." In Understanding Our Environment, Stewart Dunlop and Michael Jackson note that "Industrial waste accounted for over half the total volume of waste in Canada in the 1980's. Like domestic waste, much of this waste is preventable and much can be recycled." They go on to note the efforts of the large trans-national corporation 3M, which established a recycling programme that it calls Pollution Prevention Pays . The company claims to have established 4,651 projects, eliminating 246,000 tons of air pollutants, 31,000 tons of water pollutants, and 494,000 tons of sludge and solid wastes over the first year of each project. It also claims savings of $810 million. Not all companies have introduced such measures, but successes like those at 3M will certainly encourage others. match waste generators and users, it is supplemented by the Ontario Waste Exchange. Both companies are operated by Ortech International. Environment Canada notes that the Exchange is responsible for "about 600 waste transfers per year" in the late 1980's. Examples of such transfers included an oil refinery sending phenol by-product to a plastics manufacturer and a popcorn producer transferring, at no cost, its wastes to a pig farmer; in this case it was cheaper to give the material away than it was to dispose of it. Funding for the CWME comes from annual subscription fees - which include the exchange's bulletin, adverising fees, and government grants. The Canadian experience is not unique, waste exchanges in the United States are also now well established. The National Materials Exchange Network in the US coordinates smaller organizations - and includes Canadian representation. Recycling has come to be an integral part of resource management. Every Canadian schoolchild is taught to memorize the environmentalist's mantra "reduce, reuse, and recycle." Acceptance of these ideas is now quite widespread - and so it must be as our numbers grow. 1. How much of America's garbage finds its way into landfill sites? 2. What are the advantages and disadvantages of recycling? 3. How can governments encourage recycling? What has the provincial government done to encourage recycling in British Columbia? 4. What successes has 3M had in its corporate recycling programme? 5. What is the Canadian Waste Materials Exchange and how does it work? 6. What other organizations provide similar services to the CWME and how are such organizations financed? Some believe that Mankind is a cancer that will inevitably destroy life on this planet. They would have us believe that the problems that we face, particularly in the areas of resource depletion, ecological destruction and pollution. William Catton, author of Overshoot; The Ecological Basis of Revolutionary Change writes: "Mankind is not only depleting essential mineral stocks. We are also diminishing the plant and animal resources available to future human generations, and destroying biological buffers against the effects of global climate change." Catton believes that the longer we continue to over-tax planetary resources, the harder we will fall. Sustainable resource management ensures that the effects of our actions do not diminish, and may even enhance the quality of life as it relates to our environment for our future generations. Sustainable resource management includes focusing on human behavior that encourages resource conservation activities and resource management activities that maintain both natural resources and the continued functioning of the ecosystem from which it is derived. Sustainable resource management focuses on physical production practices that would encourage the use of resources in such a way that allows us to utilize those resources indefinitely. Sustainable resource management requires both short and long term decision-making that ensures that watersheds, plants, wildlife, people, and our economic and social systems are protected and enhanced for future generations. significant progress has been made in the last decade in confronting environmental challenges in both developing and industrial regions. World-wide, the greatest progress has been in the realm of institutional developments, international co-operation, public participation, and the emergence of private-sector action. Legal frameworks, economic instruments, environmentally sound technologies, and cleaner production processes have been developed and applied. Environmental impact assessments have become standard tools for the initiation, implementation, and evaluation of major development and investment projects in many countries around the world. UNEP recognizes that many current practices are unsustainable and that there is a deterioration of conditions in many parts of the world.However, the report writers believe that we now see a road ahead that will take us away from Catton's catastrophe. From the United Nations to Non-Governmental Organizations like the Earth Council, organizations are working toward the goal of sustainable development. Though the problems facing the world are greater now than ever, so too are the tools needed to find solutions. Chief among these is the networking and information spreading power of the Internet as used by the organizations noted above. One need only look at the web site of Sustainable Development International or the World Wide Web Virtual Library "Sustainable Development" site to see how information can be made available through pressing a few keys on a computer keyboard. What is William Catton's view of mankind's future? What is sustainable development?Do you believe that it is possible to achieve? What progress does the United Nations Environmental Programme note in the movement toward sustainable development? Explain the relationship between resources and culture. What can you do, personally, to help preserve the world's forests? Are you prepared to act? Why or why not? Research a civilization that collapsed because of poor soil management. Explain what happened and comment on whether or not the collapse could have been prevented. Will the Green and Blue Revolutions succeed in feeding the world's growing population? Why or why not? After reading this chapter, you have learned of many issues and problems revolving around our consumption of resources. You are to identify a specific global problem and outline various solutions that have been proposed to solve this problem. What solutions are being attempted? What results are anticipated from these solutions? Do any new problems develop because of the solutions attempted?